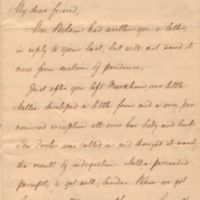 Mrs. Wilson had written you a letter, in reply to your last, but will not send it now from motives of prudence. Just after you left Markham, our little Nellie developed a little fever and a very pronounced irruption all over her body and limbs. The doctor was called in and thought it merely the result of indigestion. Nellie proceeded promptly to get well, besides. When we got home we called in our physician here, showed him such traces as remained of the irruption, and got the same verdict,—indigestion. During the last few days, however, Nellie skin has been peeling off in minute flakes, and now the doctor says she must have had an extremely mild attack of scarletina. This peeling stage is the stage at which the disease is most apt to be communicated,—and so the poor little chick has been quarentined, and Mrs. Wilson with her. Ellen therefore thinks she had better not send her letter, and asks me to write in her stead. It may be that she will be quarentined for ten days,—and that would bring us to the period of your coming. Scarlet fever, it seems, is wholly a child’s disease, and grown persons are not susceptible to the infection; but if you woould be made uneasy by the fact of its having been in the house, she hopes you will not be feel obliged to come. At the same time it would almost break her heart to miss your visit. We are all looking forward to it with the keenest pleasure; and Ellen hopes that, if you are not rendered uneasy about coming by the situation, you will not postpone your visit another day beyond the time mentioned in your last letter. Her brother has promised to come down for Saturday and Sunday, the 25th and 26th, for the express purpose of meeting you; Nellie is perfectly well now, and by that time may be expected to have stopped shedding; and,—in short, Ellen’s heart is set! You don’t know how you have both taken hold on our hearts! Ellen begs (particularly since New Orleans doesn’t now seem a good place to go to for some months to come) that you will not promise your Kentucky kinsfolk to come to them at the very first of October, but that you will generously give us the full time at first agreed upon, at least, and I cry a loud Amen! Wilson, Woodrow, 1856-1924, “Woodrow Wilson to Lucy Marshall Smith,” 1897 September 15, WWP19523, Eleanor Wilson McAdoo Collection at the University of California-Santa Barbara, Woodrow Wilson Presidential Library & Museum, Staunton, Virginia.